Anyone has a solution for Project Diva controls not fully working? I can't start a game. I can go up and down in the song selection menu with all buttons of my controller (L, R, Triangle, Square, Cross, Circle), but I absolutely can't start a game. you have to go into the test menu ... select "close settings" and set "hours" to "all time"
Is there a way to get the controls to function smoothly in Sega Racing Classic when using a G2X wheel? Im using a G29, ive also got a G25, G27, and G920. The first quarter turn of the wheel does very little, then it is very aggressive after that. Where can i manipulate the settings to fix that? P.S. Not sure what made it quote you spindizzi, sorry about that mate! Which version of Windows is best for all these games? So far ive had no real issues on Windows 7 Pro x64, but i also have genuine key/disc sets for Windows XP x64 and Windows 8.1 x64 that i have bought over the years. I had been so close... had been in the test menu before, even in "close settings", but didn't know I had to set "hours" to "all time". Anyone know if someone plans to dump project diva arcade future tone eventually now that original project diva arcade has been dumped? Nu version already works in private builds (Reaver once showed the game's test menu on stream). Welcome to emuline, enjoy your stay here. You asked very politely about the NU system, you are correctly informed. 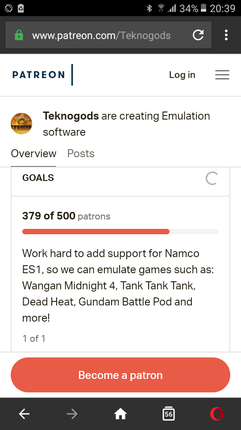 It is rumored that internal build of TeknoParrot runs NU games. Project Diva is a very straight forward setup for TeknoParrot 1.0.0.132, diva.exe is the executable file needed by TeknoParrot. Check the posts a few up on this page by gamingrob & mamefan2018 about closing times and inputs not working. You could check the TUTO section, how to setup a bunch of games. Some games / platforms, "need to have some tricks applied". Lindbergh games have no .exe files, those are Linux .elf files. BTW, By The Way, next time use JDownloader for IPFS links, as far as I can tell, downloads can be resumed. Read the tutorial about downloading from IPFS and other types of links. Press Trigger twice, Grenade twice, Trigger, Grenade, Trigger at the title screen. A sound will confirm correct code entry. Player scores will appear in the top left and right corners. Et en +, ne me dit pas qu'il faudra refaire cette manip à chaque fois ??? XInput / DInput, WTF ? This could be very handy for some people. and allows support for XInput non-compatible pads in applications (mostly games). In other words: x360ce allows you to use any pad in games that basically support only the XBOX360 pad! So has anyone played Rambo yet? I figured more people would be talking about this since it is a game alot of people were wanting...I know its patreon only but I figured someone would have said something by now. Add it to the list ? Can somebody explain the function of this "terminal" ? What is that about in "the scene", "the hard on, hard wood" ? "I got this, and you don't"
that guy basically won't share to anyone how to access debug mode in wmmt3, if debug mode would be public, wmmt3 would be playable in linux. Je suis sur teknoparrot 1.00.137 et j'ai une manette x360 pour pc, xboxone pour pc et xboxone mais le résultat est le même pour les 3 manettes. Sur d'autres jeux cela fonctionne ou j'utilise la souris, mais la c'est surtout le volant 'gauche-droite' qui fait obstacle. @Emuljp60 I use these settings in TP 1.92, otherwise no bana passport save / online. Mais si je lance google teknoparrot 1.92 cela me sort la dernière version de teknoparrot. Ou puis je trouver la version 1,92 ? But if I run google teknoparrot 1.92 this brings me the latest version of teknoparrot. Where can I find the 1.92 version? 1. Is there a way to hide the mouse cursor (I did read about this somewhere but cannot locate the information)? 2. The bullets tend to deviate a little to the left compared to where the mouse is positioned (running in Fullscreen) - any way to fix? TeknoParrot 1.0.0.131 is released, there is a automatic update, this update wrecked TeknoParrot !! So my advise is stay on 10.0.128 for the moment. Other people got the 1.0.0.131 update and TeknoParrot does not work anymore ? A fix for HOTD4 Grenades throwing when reloading. Anyone got a link to this release ? I got to have it !!! So this is a mistake right? ?